Digestive Syrup that we offer is carefully prepared using quality natural ingredients such as extracts of gugal, methi, chitrak and various others herbs . We are the known Manufacturer, Exporter and Supplier of highly effective Digestive Syrup Syrup. It is a polyherbal preparation containing herbs reputed in Ayurveda for improving appetite and detoxifying intestines. It is recommended for conditions like loss of appetite, gastritis, indigestion, acidity and bloating of stomach. 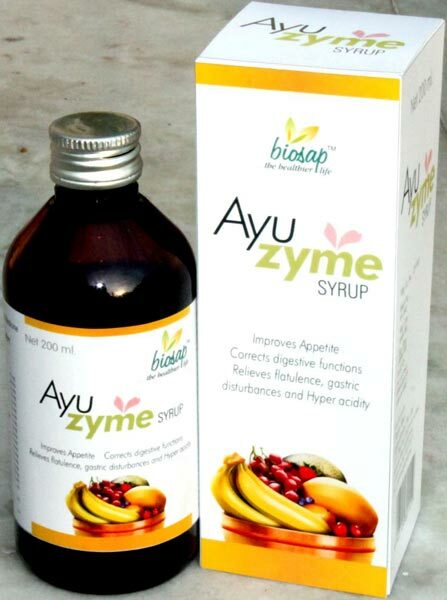 Ingredients: Extracts of Ayuzyme : Kalmegha(Andrographis paniculata), Gugal ( Balsemodendrone mukul) 600gm Methi(Trigonella foenum gracum) Chitrak ( Plumbago Zeylenica) Dalchini (Cinnmomum zeylenicum), Elaichi( Elletaria cardmom), Vach (Acorus calamus), Suddha Bhallatak (purified Semicarpus anacardium) , Suddha Kuchla ( purified Strychnos nux vomica) , Shatavari (Asparagus racemosa), Vidang ( Embelia ribes) , Kaseru ( Sicpcrus kysoor), Tagar ( Valeriana wallichi) Kumari ( Aloe vera), Kalongi ( Nigelia sativa), Jatamanshi Nardostachys jathamanshi), Parpat ( Fumaria indica) , natural spicy flavour and sugar syrup, permitted preservatives. Indications : Loss of appetite, gastritis, indigestion , acidity and bloating of stomach.